Enjoy these flavorful, meaty black-eyed peas as part of your lucky New Year's Day dinner or make them for an everyday meal. Be sure to add a pan or skillet of freshly baked cornbread or cornbread muffins and a side of sauteed greens to your menu. Buy a boneless pork shoulder and cut off about 8 to 10 ounces of meat. Freeze the rest of the pork shoulder or put it in the slow cooker for pulled pork sandwiches the next day. You could even use leftover shredded pork shoulder in the dish. Put the black-eyed peas in a large bowl or pot and cover them completely with cool water. Soak the black-eyed peas for 6 hours or overnight. Rinse and drain the black-eyed peas several times. Set them aside. In a large Dutch oven or stockpot over medium-high heat, sear the pork pieces in the vegetable oil until browned. Add the bacon to the pot and cook, stirring, for 2 minutes. Add the onion and celery and continue cooking, stirring, for 5 to 7 minutes, or until the bacon is cooked and the onion is lightly browned. Add 3 cups of the chicken broth and the garlic powder, black pepper, and cayenne. Bring it to a boil. Reduce the heat to low and simmer for 45 minutes or until the pork pieces feel fork tender. Add the drained black-eyed peas to the pot along with 1 to 1 1/2 cups of water to cover. Put the lid on the pot and simmer for about 1 to 1 1/2 hours, or until the peas turn tender but retain their shape. Add more chicken broth as necessary to keep the peas covered while they cook. Taste and add the Cajun or Creole seasoning and salt, as needed. Use the quick-soak method to cut the preparation time. Put the black-eyed peas in a large pot and cover them with water (about 6 cups for 1 pound). Bring the pot to a boil over high heat, then move it off the burner, cover it, and let the peas stand in the water for an hour or two before you drain them and continue with the recipe. 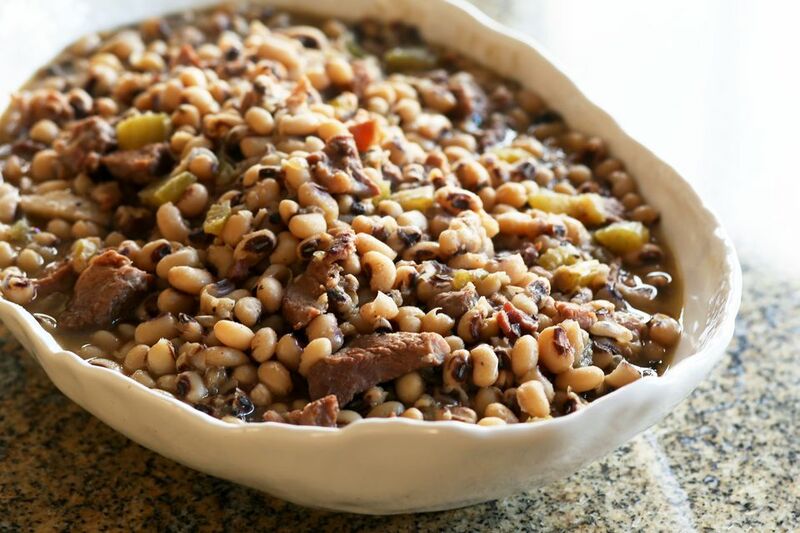 Eat black-eyed peas on New Year's for good luck!